The team hit the ground running, starting with an outreach ride-along in Brooklyn and Queens. Photo by: Breaking Ground. A group of University of Kentucky students is proving their impact can reach well beyond the Commonwealth. Together, they are using their knowledge of computer science to help some of the most vulnerable members of the largest city in the United States. More than 8.5 million people call New York City home, but far too many of them are homeless. Breaking Ground, an organization founded in 1990, is working to make sure no one has to sleep on the streets. Today, the nonprofit operates nearly 4,000 housing units across the city, making them the largest provider of street outreach, covering the entire boroughs of Brooklyn and Queens, along with a large portion of Midtown Manhattan. Their teams are on the streets 24/7/365 engaging with homeless New Yorkers. Breaking Ground also provides supportive on-site programs and services. The goal is to help those struggling with chronic homelessness get and stay on the path to a permanent home. "In addition to the 60,000 people in shelters, an estimated 4,000 people are sleeping on the streets, in parks, the subways and other places not meant for human habitation. It is this population — street homeless individuals, and specifically chronically homeless individuals — who Breaking Ground primarily serves," Jaclyn Sawyer, director of data services at Breaking Ground, said. To best serve a population in need, having accurate and reliable data is key. That's why, Breaking Ground was quick to accept the assistance and expertise of UK's chapter of the Association of Computing Machinery for Women (ACM-W). Since the fall of 2017, four computer science students, Josh Baunach, Adrienne Corwin, Jordan George and Amberlyn Schjoll, have been collaborating with Breaking Ground's Data Services Department to develop an app. 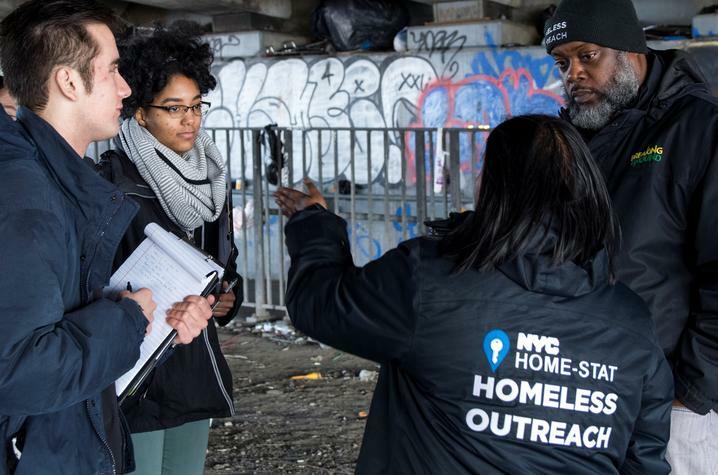 They have been working diligently with one goal in mind — to help street outreach teams collect data more efficiently and effectively. "The system they have in place currently requires the workers to spend time after their shift entering all of the information they collected into three separate systems," Baunach explained. "The app would eliminate most of the extra steps by allowing them to enter the client’s data on the streets." The group spent a semester working on the project in Lexington, but creating the app remotely presented challenges. In March, they packed their bags and headed to the Big Apple for an eye-opening experience. The team hit the ground running, starting with an outreach ride-along in Brooklyn and Queens. They were able to see firsthand the immense effort that goes into collecting data. Currently, workers have to rely on their memory for day-by-day reports. The app will address those pain points by allowing them to record data in real-time and easily pull information about a client. "The goals are to streamline data collection and sharing, reduce the time that outreach teams spend at the computer inputting data (leaving more time to engage and work with clients) and improve access to data and other resources while outreach teams are in the field," Sawyer explained. "One of the first features we implemented was a map that showed an overview of New York City. This map contains pinpoints that show the people the outreach workers met," George continued. "It feels great to be able to apply code to real-world issues. We’re using skills that we’ve learned in the classroom but also obtaining knowledge in things that our classes don’t teach us." That being said, the trip was about more than gathering information. When touring New York, the group met with those who will directly benefit from their endeavor. Schjoll described those interactions as heartbreaking and heartwarming. "It is very easy for homeless people to fade into the background. Talking to them and learning about them made us realize that the homeless population is made up of people that are in many ways just like us." Breaking Ground will gain a new app, but the students gained something even more valuable — a new perspective on life. "After this trip, I feel like my heart has been opened, and I’m thankful to be a part of Breaking Ground and their efforts to make a difference in so many people's lives," Schjoll said. The app is still in development. The team is busy implementing the desired functionality, before asking for feedback from Breaking Ground. Outreach workers are looking forward to trying it in the field.